For lots more photos of the Spiral of Light see also my Art and Travel Photography page - scroll to foot of page. Bruton’s Spiral of Light Festival was originally created to celebrate Candlemas, which traditionally falls 40 days after Christmas. This year, however, it was put back as far as late March, due to bad weather. The event starts with the setting-out of burning torches around the dome-shaped mound that overlooks the town. On top of the hillock is a ruined dovecote, which is a local landmark and is visible from most parts of Bruton. At the foot of the embankment are tents, where revellers can buy food and drink, and listen to music. On previous years, there have been more tents, along with entertainers of various sorts. Not so this year – possibly the rescheduling messed-up people’s plans. 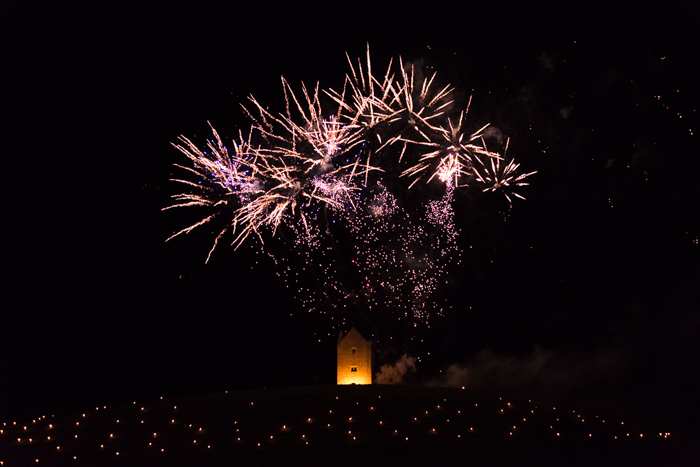 The festival culminates in a fireworks display, spectacular in its own right, but made even more so by the mysterious mound and the illuminated ruin on its summit, which appears to float on stars and becomes quite magical against the cold black sky.